I started out last night trying to cut Richard Alpert’s face out of nori, but with my eyes producing mucus like it’s going out of style (late symptom of Buddy’s cold), I couldn’t see well enough to finish. 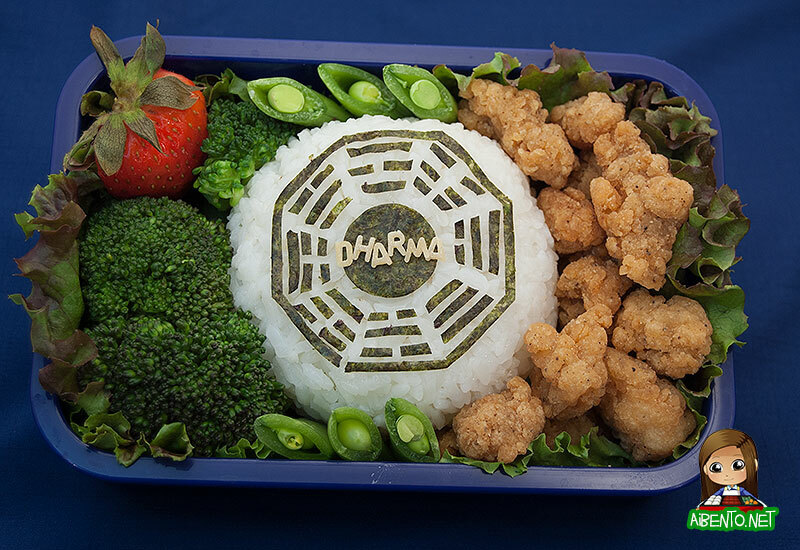 This morning I switched to my back-up of the Dharma logo to come up with a Dharma onigiri! I messed it up a bit. For one, I started in the middle and worked my way out, not putting the octagon on first. That meant when I finally did put it on and it was crooked, I had to stretch it all over. It looks a little curled because I actually took this picture at work. I took pictures with my Nikon, but forgot my memory stick at home. Thank goodness I keep my Panasonic on me at all times! The first thing I did was line the box with lettuce, then I put the onigiri in the middle. I added some American Chicken Karaage (popcorn chicken from KFC, haha!) to the right side, then sliced sugar snap peas, broccoli, and half a strawberry. I took the bento to my lightbox and then began applying the nori pieces. I had never realized before doing this that all the sections on the logo are different. I think I just looked at it and assumed it was just a grid, but as you can see, it isn’t that simple. When I was done, I added the little pasta letters to the middle for the Dharma word. I’m not crazy enough to cut out microscopic letters, sorry. Kate’s eye and Ben’s nose, yeah, but teeny tiny letters? Hell no! The chicken is something I bought after I tried to get free grilled chicken meals from KFC. The Hawaii ones only offer a free single piece instead of the meal, so I bought some extra stuff. It wasn’t that great. Mr. Pikko’s review was “tastes like crappy hulihuli chicken” which is spot on. It was dry and didn’t have all that much taste. The Original recipe stuff I bought tasted a lot better. 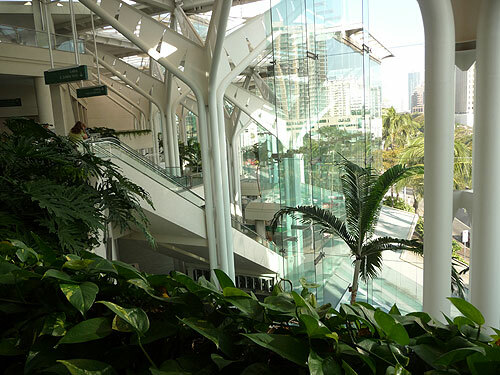 As I mentioned, I’ve been at a conference the last two days at the Hawaii Convention Center, which is where Lost has filmed its Sydney Airport scenes. I’ve never been there before, so I took some pictures. 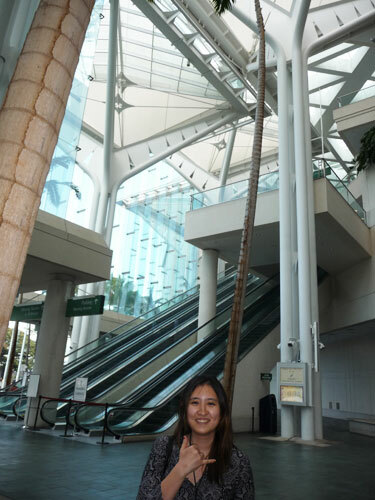 The Convention Center is a beautiful building and it’s got this gigantor escalator that runs from the third floor to the first, which is where the airline check-ins were and where Sun was supposed to run away from. I think the floor we were on was where they had those scenes with Jin, Sun, Boone, and Shannon. Anyway, that was fun! In the first four and a half minutes or so of this video Jack talks about giving himself five seconds to wallow in fear before sucking it up. I’m sure parents are familiar with the meltdown of toddlers and know that getting them to stop can be rough. This morning while walking Buddy in to school he started scream crying and whining, so I did my usual “tell him to stop and then ignore him until he does” thing. When we got outside his class though, he was still crying. I got down to his level, hugged him, and told him quietly in his ear that I would give him five seconds more to cry, but then he had to stop. I began counting very slowly, stopping at three to remind him we were almost done. He was still sobbing at four, but when I got to five it was like magic. He stopped. He just immediately quieted down and miraculously walked right into class without doing the U-Turn & Leg Cling Combo he has done like every day since he started school. I’ve never seen him walk in so effortlessly. I don't know how long this bento will last.